We always have pesto in the fridge. Simply put. We add it to everything; meats, veg, pasta, soup. It is a great way of adding a bit of green to any dish or making a bland meal turn interesting. The best part is that you simply cannot go wrong with it. Any green will do. Herbs such as basil, parsley, mint or coriander are traditionally used as the base; however, you can also add vegetables such as kale, broccoli, spinach or rocket. Extras such as chili and ginger give it a lovely heat. Your choice of nut can be used to achieve the texture. We love to toast pine nuts and add them to the mix. If you are on a low protein diet, make sure you count the nut protein content. 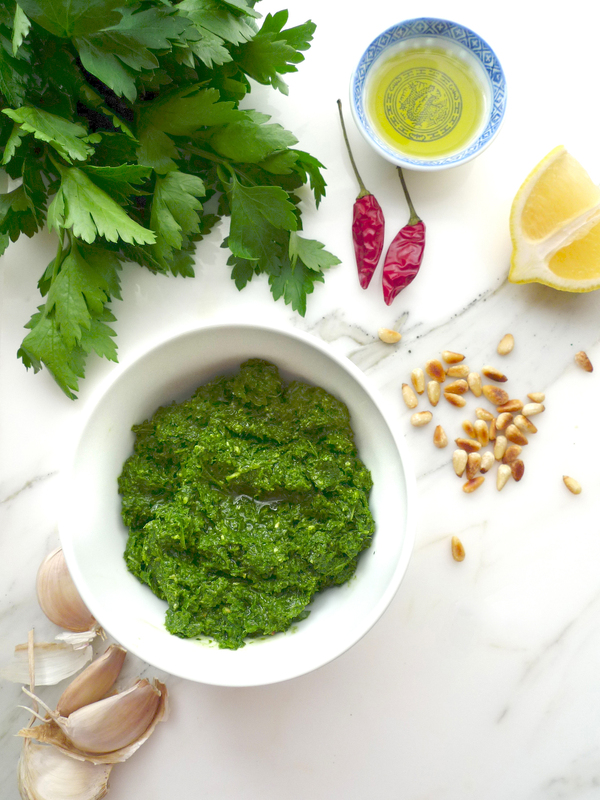 You do not have to use too many nuts to achieve the texture you’re after, and the amount you use to flavour your dishes usually makes the amount of nuts in the pesto count as little to no protein. We do not add Parmesan, and frankly, I think it tastes better without. It’s up to you. 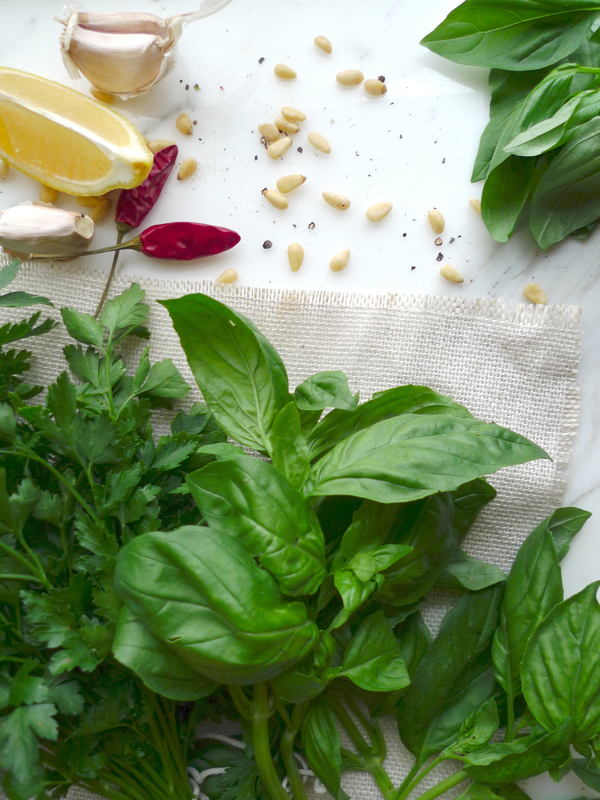 Parmesan adds a strong flavour to the pesto that some people love. 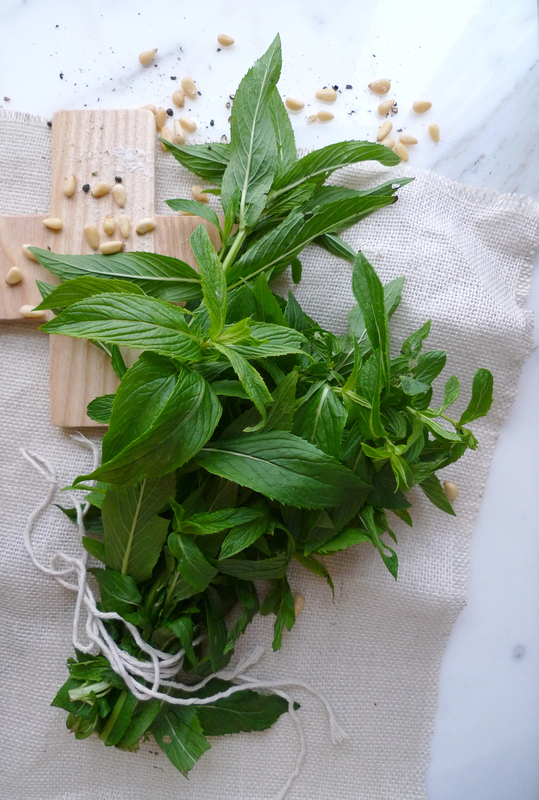 I have listed 2 different types of pesto. A herb based and a veggie based. Again, you can substitute any for your preferred ingredient. The only main difference, apart from the herb/veg is the lemon. I find the kale needs a bit more lemon juice to soften and blend the mix. Taste as you mix. You really cannot go wrong with this staple food. Combine all ingredients into your food processor and blend until smooth and has an even texture. 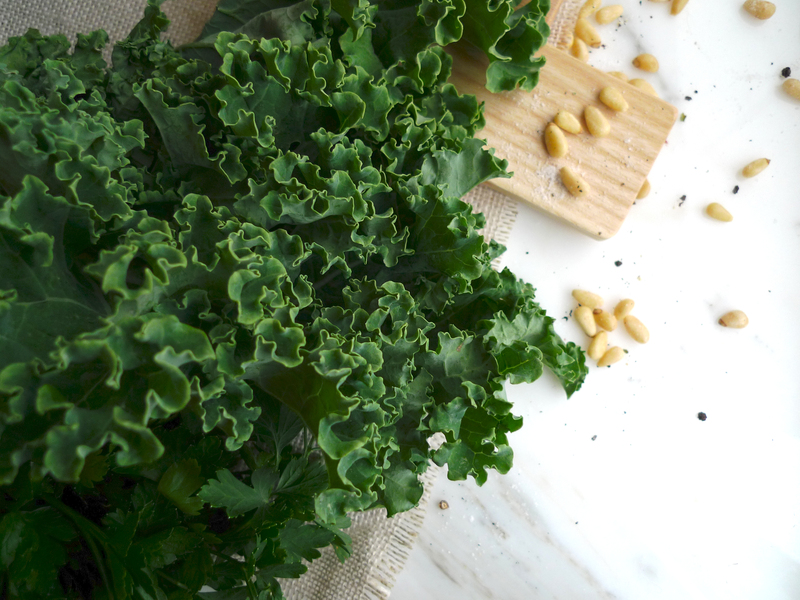 If using Kale, chop separately before adding the rest of the ingredients. Taste and adjust the flavours adding more lemon, olive oil, salt or pepper if required. Store in a glass jar and add a layer of olive oil at the top of the mixture to keep from oxidizing. It will keep in the fridge for up to 1 week. Add more greens such as broccoli, baby spinach leaves, rocket or even 1/2 tsp spiralina powder to increase the nutritional value. Substitute the pine nuts for your choice of raw sunflower seeds, pumpkin seeds, almonds or walnuts; if on a non-PKU diet. Add small amount of grated Parmesan; if not lactose-intolerant. Add a little ginger for a more Asian style flavour. Mix through vegetable or grain-based spaghetti. Use as a pizza base and top with fresh vegetables. Serve with fish or organic chicken. Mix it through scrambled eggs.